Having invested more hours over the past month than I care to admit watching the World Cup I found myself in a wooded patch of the Ohio countryside northeast of Mansfield as the championship match kicked off. I was with my friend Ralph and we had just dropped our daughters off at summer camp. What to do now? If we headed back to Columbus the match could be over before we arrived (unless of course the rules were changed so that they had to keep playing until Argentina scored). I’d done a bit of sketchy internet research on Mansfield, and the top attraction is the Ohio State Reformatory, an out of commission prison where the Shawshank Redemption was filmed. A fascinating place I’m sure, but not high on my list of ideal places to watch a sporting event. So as is often the case I suggested that we head to the nearest brewery, which in this case turned out to be JAFB Wooster Brewing, which I will hereafter just call JAFB. There was no guarantee they would have a TV, but there was a 100% chance they would have beer. It’s important to keep your priorities in perspective. As you might guess from the name JAFB is located in Wooster, which is a small college town about halfway between Mansfield and Canton. We headed east on Highway 30 arriving about a half an hour after setting out from the camp. The brewery is located in a large red brick building, that I later learned dates to the beginning of the 20th century and most recently housed a Napa Auto Parts store. 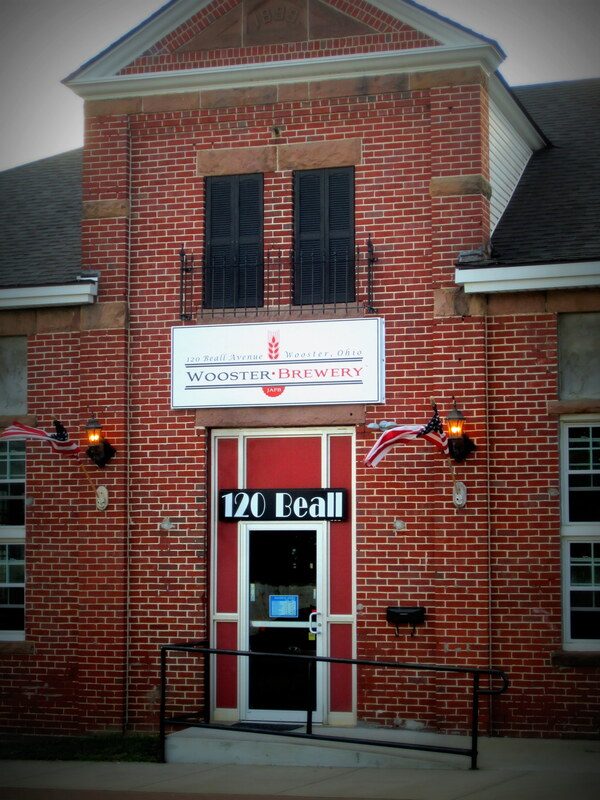 The front entrance to the brewery. To be perfectly honest we had no idea what to expect, but on entering we were in for a pleasant surprise. 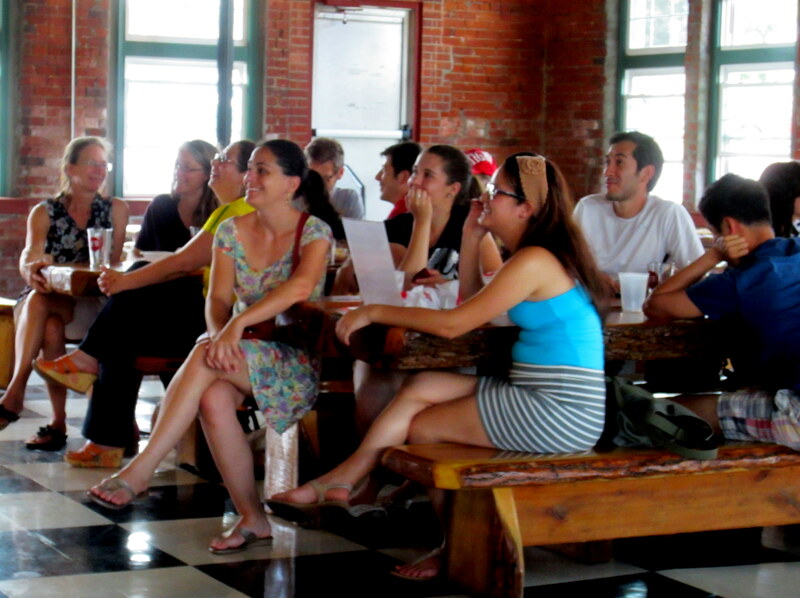 The brewery is set in a spacious, open room filled with attractive handmade wooden communal tables. Sunlight was spilling in from the windows that surround the bar area, and the floor was tiled with large black and white squares just waiting for someone to play out a chess match with life size pieces. Most importantly for us there were several big screen TVs mounted to the red brick walls and they were broadcasting the championship match with the volume turned up. There were about 20-30 people spread over a couple of the long tables watching the match. Most of the patrons were following the game closely, but it did not seem to be a particularly partisan crowd. Ralph and I took a seat at the bar and commenced with the grueling task of drinking beer and watching soccer. All eyes on the match. A few people are wondering if the US should have added more “German-Americans” to our team. After getting set up with some beer my next question was what the hell does JAFB stand for? My best guess was Jesper’s Allnight Finnish Bordello, but there were way too many windows for a bordello. The woman sitting next to me seemed to either be a regular or an off duty staff member so I asked her. She informed me that it’s an acronym for Just Another (insert your favorite F word) Brewery. Given Germany’s triumph in the world cup on the day of my visit I’m going to assume the F word she was implying was Fahrvergnügen, but it’s quite possible that the locals use a different F word. Half off drafts for anyone attired in a grass skirt. The combination of the black and white tile floor and the one piece wooden tables gives an aesthetic that I’m going to call “1950s diner meets ski lodge” (google images associated with the words “1950s diner” and see what comes up). Taking this quirky combination a step further are two sculptures located on opposite sides of the bar. Guarding the entrance to the toilets is a five foot tall statue that would not be out of place in a Polynesian restaurant. 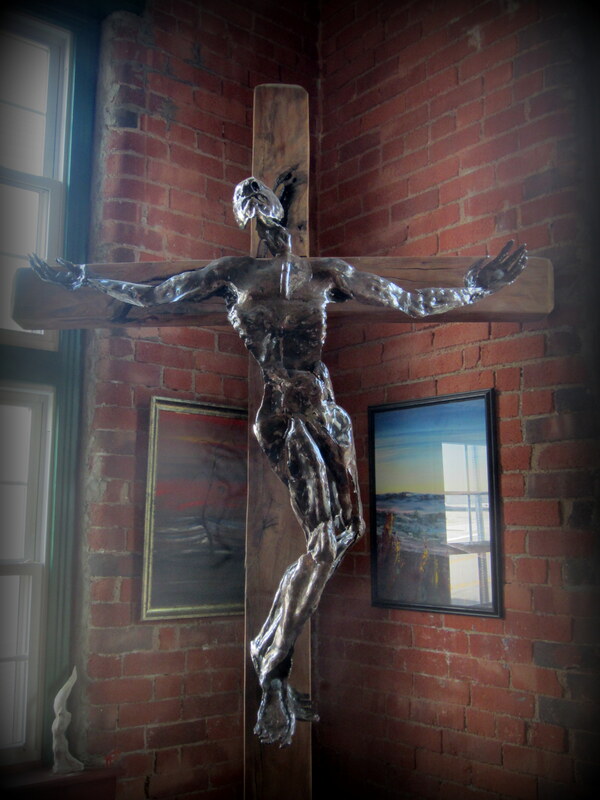 In the opposite corner is a nearly life size metal sculpture of Christ suffering on the cross. It’s a serious piece of art, but it seems a little solemn for a venue that regularly hosts polka bands (the Chardon Polka Band are shooting a video at JAFB on August 15, don’t miss it). There were not a lot of people sitting in this corner of the bar. The décor might be somewhat eclectic, but the beer is very solid. They only serve house brewed beers, but the tap list spans an impressive range of styles—cream ale, roggenbier, session IPA, two full strength IPAs, stout, witbier, saison, coffee porter, esb, red ale, and a Belgian style pale ale. Given the selection it was hard to choose, but I settled on the Roggenbier, the Harvest Saison, the JAF IPA, and the New Stunt IPA IV. Watching the world cup in style. 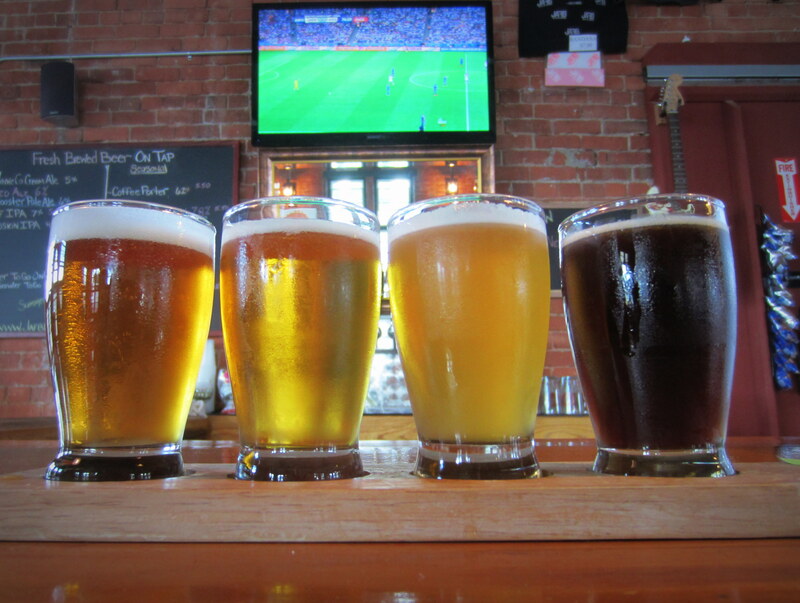 The beers from left to right are JAF IPA, Hop Stunt IV, Harvest Saison and Roggenbier. I felt the Roggenbier was good but not exceptional, but then again I’ve not tried that many roggenbiers. The other three beers were definitely worth a return visit. The Harvest Saison was equal parts spicy black pepper and fruity esters, with a crisp dry finish. It would have done well at my recent saison blind taste test. The JAF IPA was a hop-forward, west coast IPA, packed with an enticing mix of floral and fruity hop aromas and flavors. It’s easily in the upper echelon of IPAs that I’ve tried in the last year or two. I later learned that it took home the best in show prize at the 2013 Fat Head’s IPA Festival, beating out beers from the Brew Kettle, Columbus Brewing Company, Rhinegeist, Willoughby, and Three Floyds. The Hop Stunt IV was similar to the JAF IPA but was a little lighter and more floral. I’ll come back to this beer later. For those of you living in Columbus or further afield you may be disappointed to find out that JAFB beers are neither bottled nor canned and their availability is largely limited to the brewery and other bars and restaurants around Wooster. If you enjoy good beer and are in the vicinity of Mansfield, Canton or Wooster it is worth the extra time to make a stop at JAFB. According to Google maps it’s a 45 minute drive from JAFB to either of the well-known Akron breweries, Hoppin’ Frog or Thirsty Dog. Ralph demonstrating the proper bar stool posture. After the World Cup Final wrapped up, thankfully without going into penalty kicks, Ralph and I were nursing our pints and contemplating a satisfied trip back to Columbus. At this point the day took another unexpected turn as a gentleman in a turquoise t-shirt who was helping out behind the bar struck up a conversation with us. This is noteworthy because he was none other than the JAFB brewmaster, Paul Fryman. 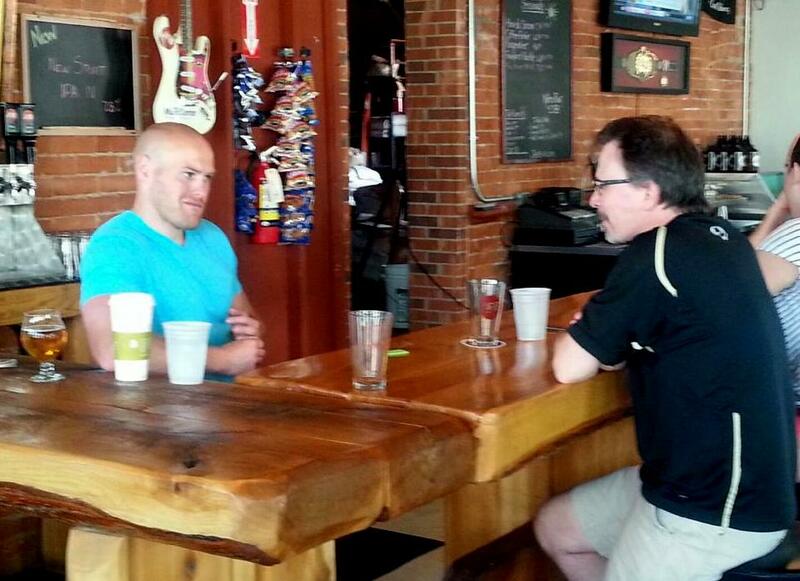 We must have talked for over 30 minutes on a wide range of beer topics. Paul and I share a preference for dry saisons and floral/fruity IPAs. Paul grew up not too far from Wooster, but started his career working for Great Divide Brewing in Denver. He then moved to Lake Placid, New York to take a position with Great Adirondack Brewing. This was followed by a move to Snake River Brewing in Jackson Hole, Wyoming (this is not too far from where my family lives and if you are not familiar with them I can attest that they make some very good beers), before returning to Great Adirondack as the head brewer. In 2011 he swore off living in the mountains and returned home to plains of Ohio to open JAFB with his father and brother. I learned that his philosophy is to concentrate on building up a strong core business at the brewery and in the surrounding community. He’s in no hurry to start bottling or canning his beer in order to compete in a saturated beer market around the state. The brewery first approach has worked for some pretty iconic breweries like Alpine, Toppling Goliath, Russian River and Three Floyds. Closer to home breweries like Jackie O’s and Seventh Son seem to be doing pretty well using a similar philosophy. Given that strategy he told me it’s important for JAFB to make good beers across a variety of styles so they can satisfy a range of people when they come into the brewery. Hence, the tap list normally has 15 or so beers. Don’t look for JAFB to start specializing a small niche of the beer market. I learned that Hop Stunt series of beers (currently on version #4) are experimental recipes aimed at finding the perfect IPA. All of the hop stunt beers have a similar malt bill but each one uses different hop varieties and additions. Given the quality of the two IPAs I had on my visit, and Paul’s propensity for working with interesting hop varieties (Sorachi, Amarillo, Nelson Sauvin, Citra, Mosaic, etc.) I’d like to see where this experiment finishes. For a place that was completely off my radar, JAFB was an awesome surprise. They brew high quality beer that can hold its own against the top breweries in Ohio. 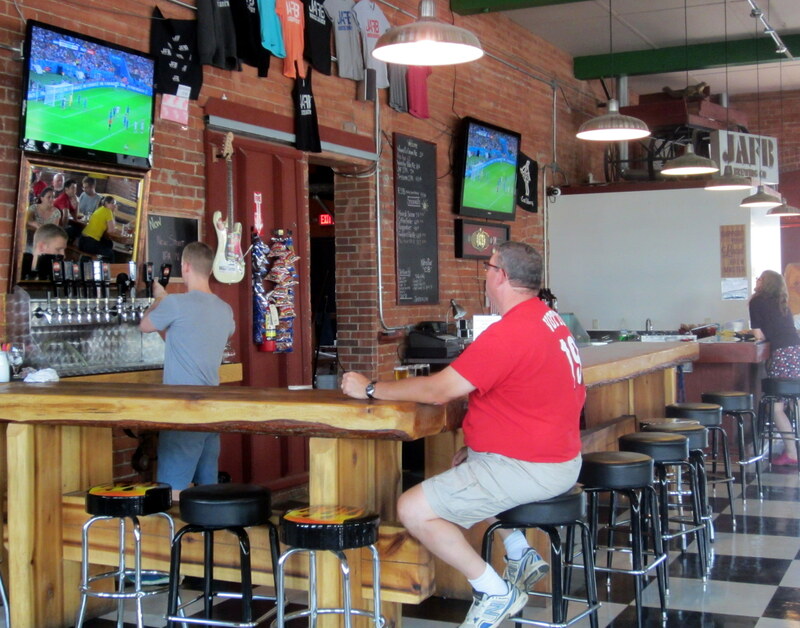 If you are going to be visiting breweries in the Akron and Cleveland areas it would be worth your time to drive into Wooster and visit JAFB. If any of my friends are reading this and would like to make a visit, let me know and I’ll be happy to tag along as the guide. Paul says he will soon have a barrel aged quad coming out, which seems like an enticing reason to visit, and who knows how good Hop Stunt V will be. 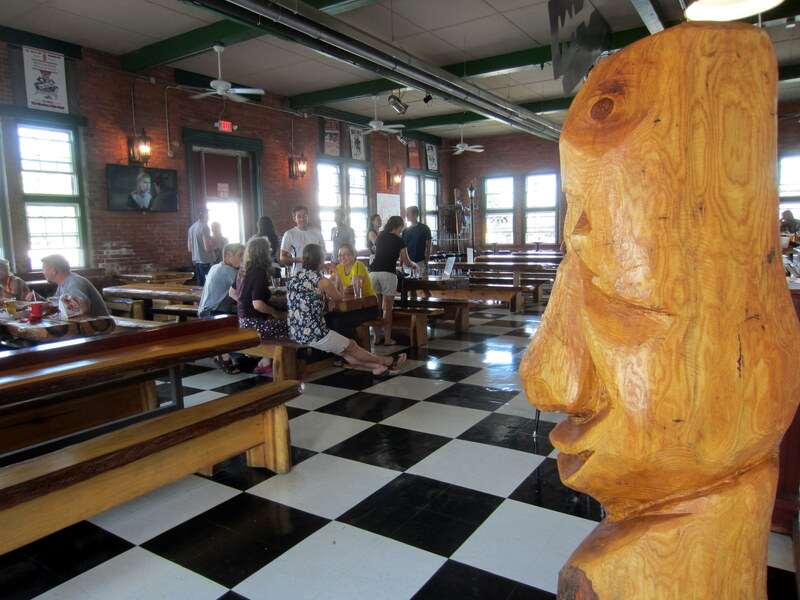 The artwork in the taproom is from the brewmaster’s father, who is an artist , and the brewery was previously his art gallery before he turned the building over to his son to start making the finest brews in the area. Thanks for that information. The art was good and gives the brewery an interesting twist. I probably should have asked Paul about the art during my visit. I do agree with you that the beers are excellent. I’ve been to JAFB a few times and love it. Cool atmosphere, great beer. Loved your review! Melissa, we’re in agreement on both aspects of JAFB. Glad to hear you liked the review.